Dimensions: 9 7/8" x 2 1/2"
Pentek C1 Carbon Water Filter Cartridge is a 10"x2.5" Carbon cartridge # 155001-43. C1 Water Filter is a 5 micron, dual purpose powdered-activated Carbon Water Filter Cartridge. Reduces fine sediment, dirt, rust, sand, scale particles, chlorine taste and odor, and removes bad taste and odors. 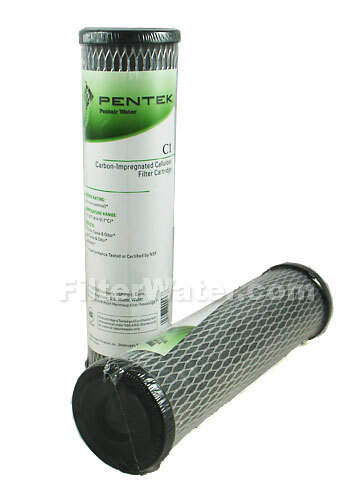 The Pentek C1 Water Filter Cartridge 155002 (also known as W5CIP ) is a general purpose carbon filter that provides healthier, better tasting water, and has a high dirt-holding capacity. Reduces chlorine, taste and odor for over 2500 gallons at 1 gallon per minute water flow. C-series Carbon Cartridges are manufactured using carbon impregnated cellulose media. Filters are recommended for chlorinated water supply. The body has polyester reinforced backing and external netting that provides additional strength and sediment-holding capacity. Pentair C1 Carbon filters 155002-43 are suited for a wide range of residential application and make an excellent polishing filter when used in process or closed-loop streams. Flow Rate: for best filtration 1 gallon per minute, up to 5 gallons per minute capable. Capacity: Up to 5,000 gallons, replace every 3 months. * Note: Estimated capacity tested at a given flow rate using 2 ppm free chlorine to 0.5 ppm breakthrough. Fits following Brands: PENTEK, Cuno, Filterite, Keystone, U.S. Water ( US Water ), Water Resources and most Harmsco filter housings. Compatible with Culligan, Ametek, US Filter, Plymouth, Kleen Plus, American Plumber, Bruner, and other standard 10" housings. Also fits Ametek CTR-210, Culligan HF-150, HF-160, HF-360, HF-365, US-550, US-560, SY-2000, SY-5167, SY-5197 filter systems. Pentek C1 Carbon Filter is the same as the following filters: Ametek C1, Culligan C-1, USFilter C-1, Pentek C-1, American Plumber C-1, American Plumber W5CIP Carbon Wrap Water Filter, Plymouth Products C-1, Kleen Plus C-1.